this is a gorgeous horse, inside and out! Very easy to get along with, cheerful perfect manners. She is well-started under saddle and currently finishing training with potential for Endurance, jumping, Sport horse, Trail Riding or great as a rideable broodmare with her outstanding pedigree! Brave forward and fun-loving! Solid conformation, good legs and feet, strong hip, pretty mover, with big eyes and great tail carriage! 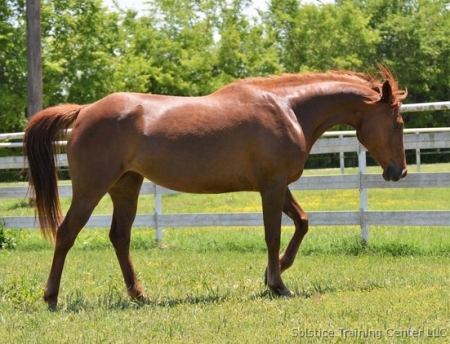 She is a chestnut rabicano with a flaxen mane and very eye catching! Smooth to ride, loves people and other horses, this is a super mare. call or tex (702) 660-5836 can arrange shipping anywhere in US call or text for quote.